Are you a museum lover and a Science buff? Then take time to check out the Mind Museum in Taguig. My two closest friends and I (See: Summer Sunshine in Bolinao) went out to celebrate Jo-e's birthday. We usually watch a movie after dining out but this time we decided to deviate from our normal routine. First off, food! Hahaha! We ate at Chelsea's which is located in Serendra. The food is a bit pricey but we decided to splurge since it's a birthday celebration. Ambience-wise it was pleasant. The patrons were quiet or speaking in hushed tones and seem to enjoy the laid back atmosphere. We chose from their "Big Plate" list which is good for three people. 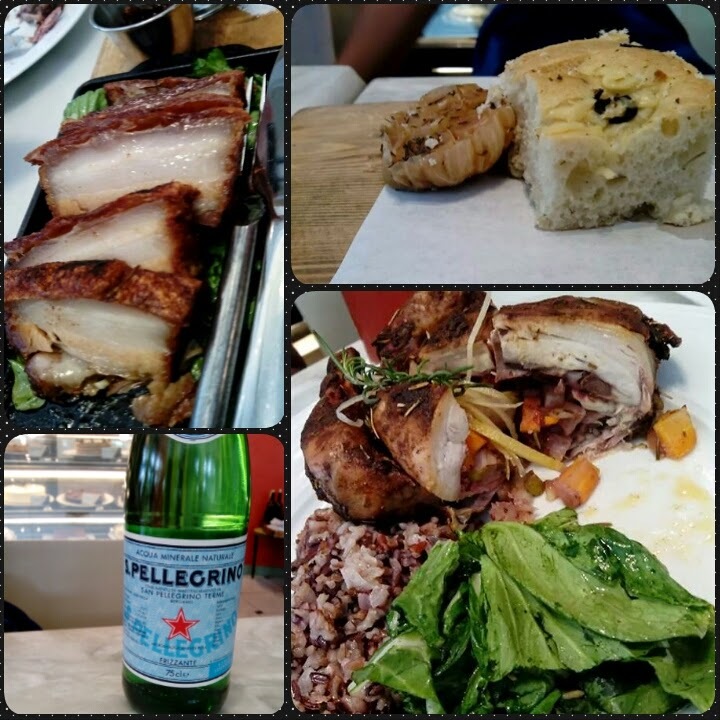 We ordered Roasted Whole Garlic & Rosemary Chicken, Crispy Belly Confit, and Wild Rice Pilaf. I ordered Pomegranate Oolong Iced Tea, Joey ordered Strawberry Mint Lemonade and the birthday girl chose to have Apricot and Mint Iced Tea. The drinks were served in less than ten minutes though it took a while for our food to arrive probably because there were a lot of people. The first dish to arrive was the Roasted Whole Garlic and Rosemary Chicken. Presentation was good and although the chicken was a little dry, it still bursted with flavour. The Wild Pilaf Rice makes up for the dryness of the chicken. But the highlight of the meal was the Crispy Belly Confit. The skin was made of crunchy goodness while the meat and fat melt in my mouth. We seriously considered ordering a second serving but decided against because it might take a while before it's served. We were sooo full! We walked all the way from Chelsea's. (It's not that far, believe me.) The ticket booth is outside and paid Php450 each. The Mind Museum is situated at JY Campos Park in Bonifacio Global City, Taguig. According to their website, the museum is run by a non-profit organization. All of their ticket sales go to the museum for the building maintenance, exhibit development and and ticket subsidies for public school students. Food and drinks are not allowed. Pets are also not allowed inside. The museum has five galleries. The Atom Gallery exhibits the function of the atom and . There's a giant chocolate (yum!) that explains and shows what atoms look like when broken down. The gallery discusses the atom, energy, magnetism. There's a also the Static Chamber. You hold on to a static ball and watch your hair stick up. I looked like a human sea urchin (LOL). The Earth Gallery features all of the forces that aided in forming and reforming the Earth. It discusses natural history to help understand how the Earth came about as we know it today. It also features the first Tyrannosaurus Rex (T-Rex) in the country named Stan, after Stan Sacrison, who in 1987 discovered the most complete male T.rex skeleton ever unearthed. The Life Gallery exhibits the Earth as a living planet and all of its inhabitants. It focuses and exhibits different kinds of habitat where different types of organisms live. It includes a massive display of the human brain where you can walk inside and understand how it works like which part is used when we move, think or feel. There's a lot of interactive exhibit in this gallery like the Big Cell Console that lets you see and feel the parts of a cell. There's also a four-set computer that quizzes your knowledge about the cell and the brain. The Universe Gallery is my favorite part. It features how life in the universe started by the stars in space. The ceiling looked like a starry, starry night. There are chairs that lets you lean back and watch the stars. There's also a mini planetarium that shows a short films to help understand how the universe aided in the creation of organisms. The Technology Gallery takes up the whole second floor and what kind innovations took place to invent the tools and gadgets that we use today. There's a mini arcade zone for the kids to use and enjoy. Trying their hands on building molecules. What does a sound look like? We enjoyed the museum like a bunch of rowdy five-year-olds. Hahaha! We tried everything although some of the interactive displays were not working. I hope they get fixed so future visitors can enjoy the facility. ^__^ All in all, it was not a bad experience. We had fun and learned a lot at the same time. In The Mind Museum, Science is never boring.